The root or Instinctual brain, being primarily concerned with movement, the limbic system with Emotions and the cerebral cortex as the primary Thinking centre. The 8,9 & 1 in the Instinctive Triad Concerned with: Resistance & Control of the Environment. Have issues with Aggression and Repression. Seeks Autonomy – based on physical tensions. 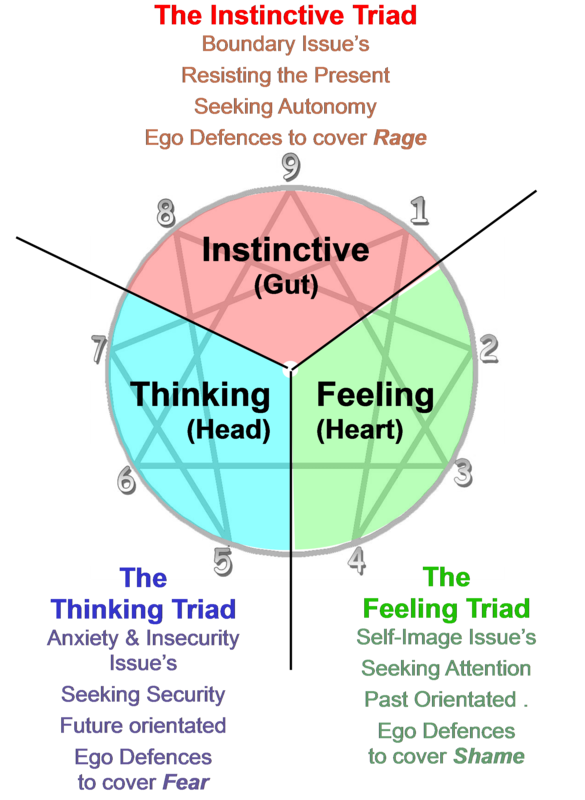 The 2,3 & 4 in the Heart Triad Concerned with Love of False Self & Self-Image. Have issues with Identity & Hostility. Seeks Attention. Underlying Feeling: SHAME. The 5,6 & 7 in the Thinking Triad Concerned with Strategies & Beliefs. Have issues with Insecurity & Anxiety. Seeks Security. The nine Enneagram types are equally distributed between the three Centres. Each type represents a unique way the centres becomes distorted, and out of balance . (further reading: Wisdom of The Enneagram by Riso-Hudson pg.49) Relevant Workshop: Wisdom of The Enneagram Workshop. An Enneagram Institute Authorised Workshop where we make deep connections with each centre as a direct experience. 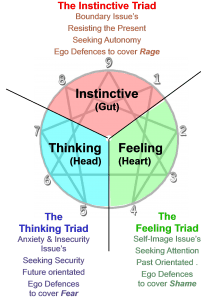 The Enneagram reveals the way each type distorts the quality by either forcing, controlling or dampening the quality. Take what each ‘seeks’ and enquire into your version of each quality. How do you directly experience Autonomy? How do you look for Security? How do you seek Attention? Remember, be gentle with yourself and others, bringing a non judgmental compassion to what you discover.